Working in the energy sector in America can be fast paced. It is primarily focused on reducing a homeowners energy bills. Cost is king. My days are filled with contracts, panel spec sheets, emails, and calls. My solar clients tend to be middle class or upper class. They are typically homeowners with high energy use. This means pools, air conditioning, large homes, and other energy hogs like entertainment systems. However, I recently had the opportunity to see another side of solar...the live-changing nature of it. 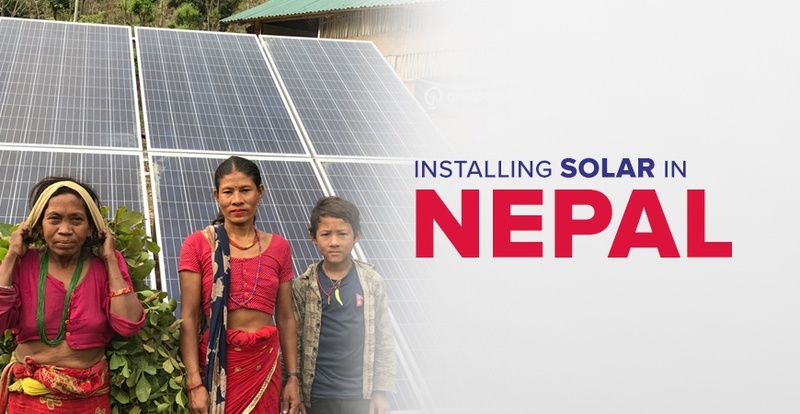 Last month, I had the privilege of helping to install a small, off-grid solar system in Nepal. 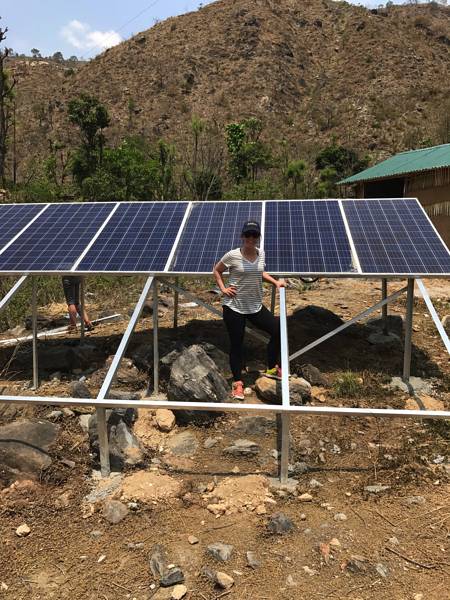 The microgrid installation was located a day's drive into the Himalayas outside of Kathmandu. As we drove to the site location, I saw less and fewer lights until I saw the literal end of the electrical grid...and then we kept driving into the mountains. The dirt road got bumpier, we took detours when the cliffside bridge collapsed, and we drove through rushing water across the road. The village is called Madji Gaon, which means “Fisherman's Village.” It is a group of around 52 homes in a valley near a riverbank, surrounded by peaks. The river has recently been dammed upstream. This has significantly reduced the amount of fish available to the village. This in conjunction with the lack of electricity is causing the village to shrink in population. Able-bodied men are leaving to work in the coal mines of nearby India to make ends meet. There is a distinct lack of men in the village between the ages of 14-40. I traveled to the site with a small group of solar professionals from America. We each had different roles within the solar industry - finance, sales, interconnection, site procurement, owner/operator, etc. We work in different, and sometimes even competing solar arenas. We were there under one name, the non-profit GivePower. There was also a Nepalese crew with us consisting of translators, cooks, solar experts, and a small film crew. The film crew was there to document the changing cultural narrative of the village, and the impact electricity might have on its future. 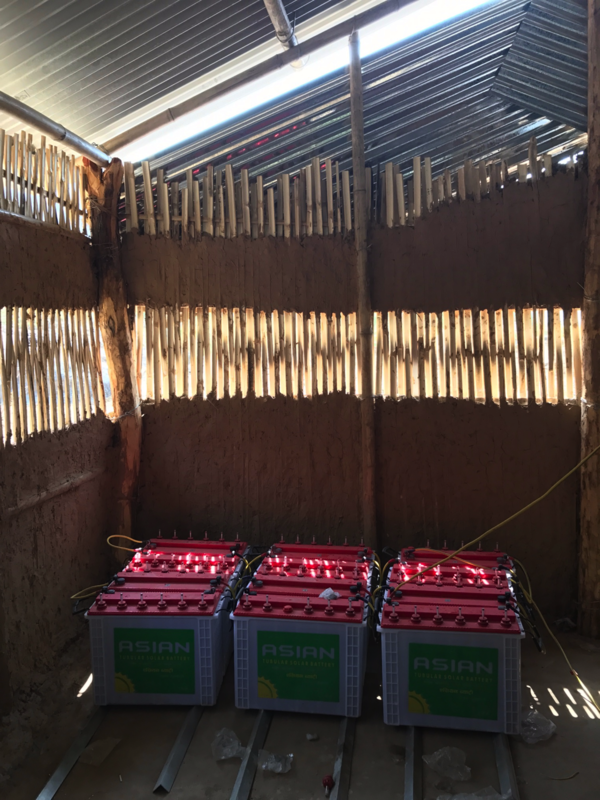 Something like electricity can bring commerce, healthcare, and stability to the growing village. GivePower facilitates the people, finances, supplies, and labor of the project. It takes significant coordination to pull together a solar project of this magnitude in this location. Numerous groups and organizations came together to make the installation possible. The villagers themselves contributed significantly to be eligible for the install. By the time I arrived at the installation site, significant work and preparation had taken place. 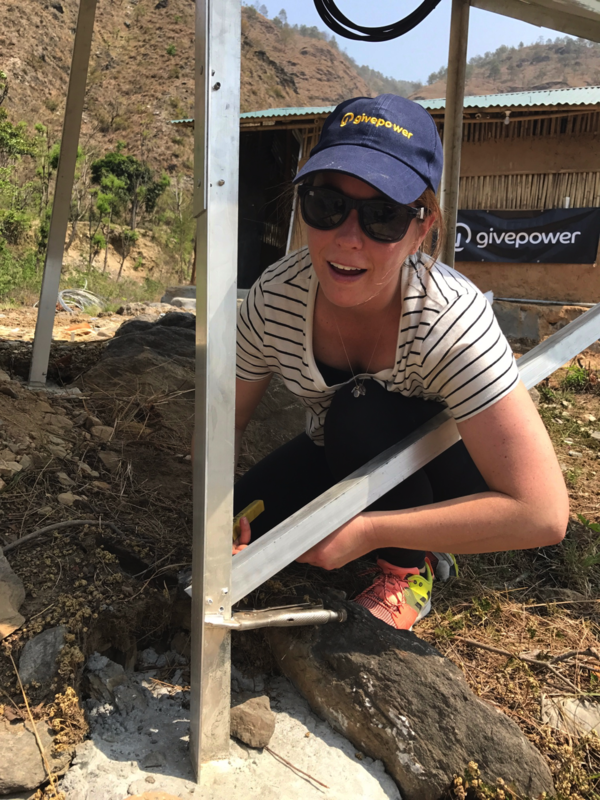 The GivePower team got to work on the solar array. We fortified the existing aluminum frame to make it sturdier and more weatherproof. Then we began mounting and securing the solar panels onto the ground mounted frame. With limited tools and supplies, there was a lot of problem solving and innovation to make sure the system was secure, safe, and functioning well. As the week went on, we finished mounting the panels and began installing various fittings and finishings to the system. We dug a deep trench for and installed a grounding stake to prevent the system from being damaged by electrical storms. We designed and built a rack for the battery array to protect it from water damage. We trenched and ran underground conduit to connect the solar array the inverter and battery structure. Part of the group began mounting the inverter to the internal wall. Another small group was clipping and taping wire and fittings to create the connections between batteries. Later in the week, we helped to wire the school for electricity for fans and light bulbs we assembled. Outside the school is the main village square. Students play soccer and chase roaming dogs. Women sit on the grass eating snacks and talking. It is the center of the community. On our last night, we all gathered outside the school in the grassy lawn. The entire village was there. Some of the young women had on their traditional clothing reserved for special occasions and performed dances for us. The cooks were busy cooking a special meal for the occasion, goat. Tonight was the night we turned on the solar system. The village brews a hard alcohol called “Roxy.” We were each given a small metal cup with it, and we began the countdown. 3….2….1...and the string of lights over the grassy lawn lit up! Let the dancing begin! We danced until late into the night under those lights. The village women were grabbing my hands and hips, showing me how to dance to the Nepali music. There wasn’t any speaking as we didn’t know each other’s languages. 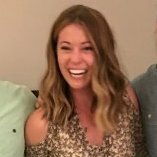 But the tears of joy, hugs, and huge smiles said plenty. Fun Fact: Did you know Nepal is the only country in the world that doesn't have a rectangular flag! ?